The estimations of moon dust and surface electrical fields are important to future human and robotic activities on the surface of the moon. Apollo astronauts had witnessed the maintaining of micron- and millimeter sized moon dust up to meters level while walked on the surface of the moon. The characterizations of the moon dust would enhance not only the scientific understanding of the moon but also the future technology development for the surface operations on the moon. It has been proposed that the maintaining and/or settlement of the small-sized dry dust are directly related to the level of the surface electrical fields on the moon, and the impaction and interaction between lunar regolith and the solar particles. The research of the relationship between the moon dust distributions and settlements direct affected the safety of long term operations of future lunar facilities. Through analyzing the imaging of the legs of the moon lander, the cover and the footwear of the space suits, and the envelope of the lunar mobiles, we estimated the size and charges associated with the small moon dust particles, the gravity and charging effects to them along with the lunar surface environment. For an in-situ measurement and remote sensing observation perspective, we planned a lunar penetrator equipped with a thermal imager and a tailed 3D field mills for the electric fields measurements. In this paper, we present the preliminary study of our simple estimations for future better understanding and modeling; as well the concept study of our brief penetrator design, based on the CubeSat for future technical development. 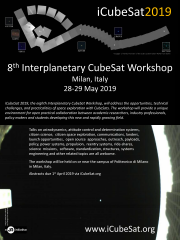 We also look for collaborators who are engaging in the scientific modeling of the moon dust and lunar surface environment; and who are interested in the technical challenge of the CubeSat based penetrator and the associated instruments.